Kavisha’s concert and workshop this weekend were not just good. They were superb. I’m suffering withdrawal symptoms as I write. Kavisha is world class, an artist at the top of her form. And wow, didn’t we enjoy this intimate, enthusiastic, beautifully delivered performance she crafted for us at the Woy Woy Opera House on Saturday? The perfect fare to follow up a unique, engaging and wonderful singing workshop the night before. 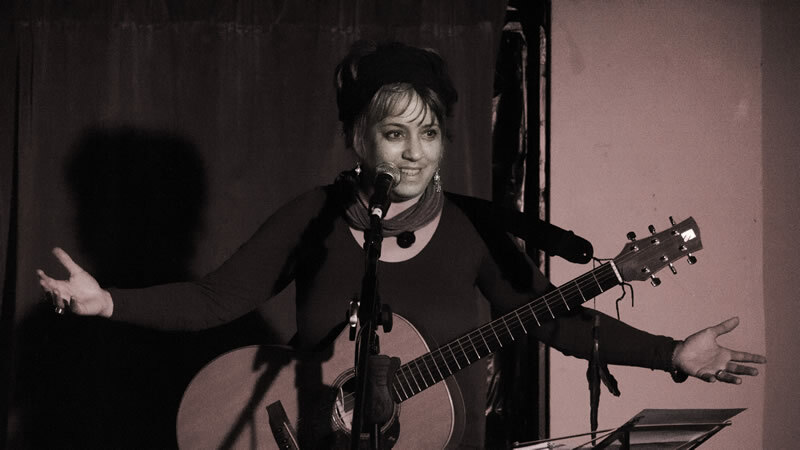 Kavisha has been writing and performing across Australia and with occasional international visits for over two decades now. She has an impressive catalogue of great songs she has written, from her much loved Aria awarded hit ‘Invisible, Indivisible’ through to new songs such as ‘Sing for No one, Sing for Everyone’ that show her to be in the front rank of singer-songwriters. She can also make claims as a musicologist, especially in the way she uncovers, researches and then has introduced some of the most beautiful traditional Italian folk music and traditional tunes to Australian folk audiences. With her latest and perhaps most accomplished album, ‘Riturnella’, she demonstrates her prowess as an instumentalist, too with a sensitive and accomplished accompaniment on guitar that leaves us guitarists in wonder. On Saturday night she she showed us too how she can put it all together in a great live show with wonderful, very personal stories, inspirational comments and high class character acting in which she draws on impressions of some of those she has encountered in her travels over the years. Her performance to a full hall on Saturday night was one to bottle and cherish for years to come. It also reminds us all, if we ever needed reminding, why live music can never be replaced by recordings. Kavisha’s performance was well supported by some great floor spots by Hugh Worrall with to two great new songs, Shirley Hotchkiss who lead some the hall in community part singing, Marilyn (at her yodelling best) and Frank Russell – who were joined for their final two numbers by Cec as he made up the ‘Usual Suspects’. I did my best, too, with a rendition of Dance Me to the End of Love, in tribute to Leonard Cohen and as a brief celebration of his 80th birthday earlier in the week. What a night. What a Troubadour weekend.